If you or your loved one are suffering from untreatable visual impairment, you can still be supported through advice on how to maximize vision through illumination and magnifying aids, as well as moral support. Older people often notice that reading small print becomes more difficult and they assume that stronger glasses are the answer. Sometimes this is the case and therefore it is important to have your glasses checked regularly to ensure they are the correct strength. However, if you have done this and reading is still difficult or tiring, it may be that improving the illumination may help. For reading to be easier and more comfortable, make sure that you are wearing the correct spectacles and that the reading material is well-illuminated. 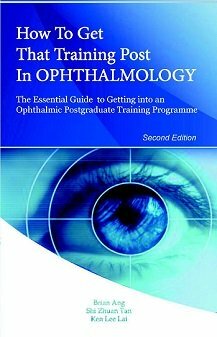 For those who have been diagnosed with an ocular disorder such as cataract, glaucoma or macular degeneration, the reading brightness is even more important. This is because eyes with low vision need about two to three times the level of illumination as normal-seeing eyes. Illumination alone, when used correctly in these circumstances, may significantly improve reading comfort and reduce fatigue. Closer distance: The output of a lamp is greatly influenced by the distance from the page. It is worth experimenting with the position of your reading lamp to see if a closer distance improves your reading ability and comfort. Side positioning: Rather than placing the reading lamp behind you, move the lamp to your side. 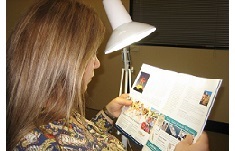 Position the lamp as close as 6 to 8 inches (approximately 15 to 20 cm) from the page and below eye level. 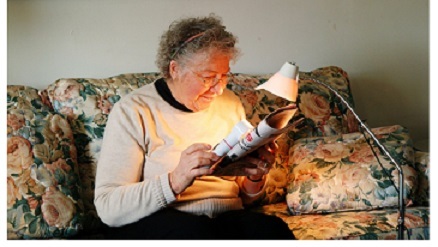 Increase brightness: Your reading lamp needs to be bright enough for reading. Compact fluorescent lamps need to be up to 15 to 20 watts while light-emitting diode (LED) globes need around 10 watts. 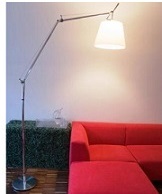 Anglepoise lamp: If you are sitting in an armchair, an anglepoise lamp with an adjustable arm is usually the best choice. The advantage with an anglepoise lamp is that you can move the lamp as close to the page as you need to for comfortable reading. Consider a wide shade and one that is deep enough for the length of the globe. Try different globes: You can also try different types of globes, such as a cool white or daylight globe, and compare the illumination from these globes a warm white globe. You may find that one type of globe is more comfortable for reading, while another creates a sensation of discomfort or glare. If you would like more information about this as well as other useful suggestions and services offered by Vision Australia, please visit the Vision Australia webpage on learning to live with low vision.